CS were approached by RG Carter to supply and install external solar shading for the new Ely Leisure hub in North Cambridge. 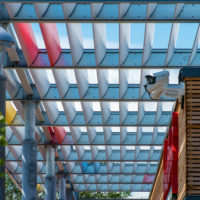 CMP Architects wanted the shading solution to make a bold statement by incorporating different coloured blades throughout the cantilevered Brise Soleil system. Discover the complete project.